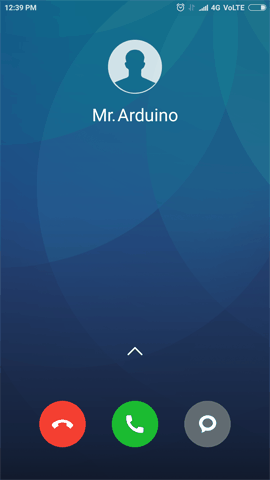 Whether you want to listen to what happens in your house that’s miles away from you or activate sprinkler system in your garden just with a silent call; Then SIM900 GSM/GPRS shield serves as a solid launching point for you to get you started with IoT! SIM900 GSM/GPRS shield is a GSM modem, which can be integrated into a great number of IoT projects. You can use this shield to accomplish almost anything a normal cell phone can; SMS text messages, Make or receive phone calls, connecting to internet through GPRS, TCP/IP, and more! To top it off, the shield supports quad-band GSM/GPRS network, meaning it works pretty much anywhere in the world. 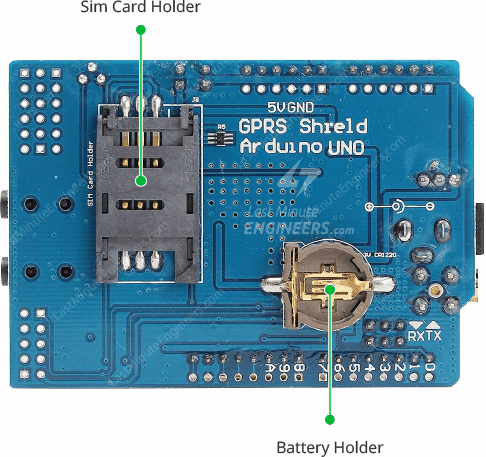 The SIM900 GSM/GPRS shield is designed to surround the SIM900 chip with everything necessary to interface with Arduino, plus a few extra goodies to take advantage of the chip’s unique features. 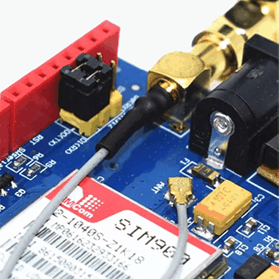 For more information about SIM900 GSM Cellular chip, check out this datasheet. There are three LEDs on the SIM900 GSM/GPRS shield which indicates connectivity or power status. By observing these LEDs you can get a visual feedback on whats going on with the shield. PWR: This LED is connected to the shield’s power supply line. If this LED is on, the shield is receiving power. Status: This LED indicates SIM900’s working status. If this LED is on, the chip is in working mode. Netlight: This LED indicates the status of your cellular network. It’ll blink at various rates to show what state it’s in. 64ms on, 800ms off: The SIM900 chip is running but not registered to the cellular network yet. 64ms on, 3 seconds off: The SIM900 chip is registered to the cellular network & can send/receive voice and SMS. 64ms on, 300ms off: The GPRS data connection you requested is active. One of the most important parts of getting the SIM900 shield working is supplying it with enough power. The operating voltage of SIM900 chip is from 3.4V to 4.4V. 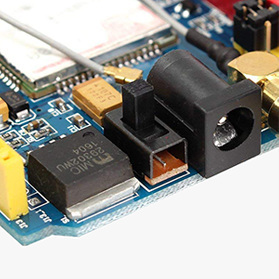 To keep supply voltage safe at 4.1V, the shield comes with a high current, high accuracy, low-dropout voltage regulator MIC29302WU from Micrel – capable of handling load currents up to 3A. You can add an external power supply to the shield with the 5.5mm DC jack, to which you can connect any 5V-9V DC wall adapter you have. Next to the DC jack, is a Slide Switch to select the power source labeled EXTERN. To use external power source, move the slider as shown above. The power supply should be able to source minimum 2A of surge current, otherwise the chip will keep shutting down. 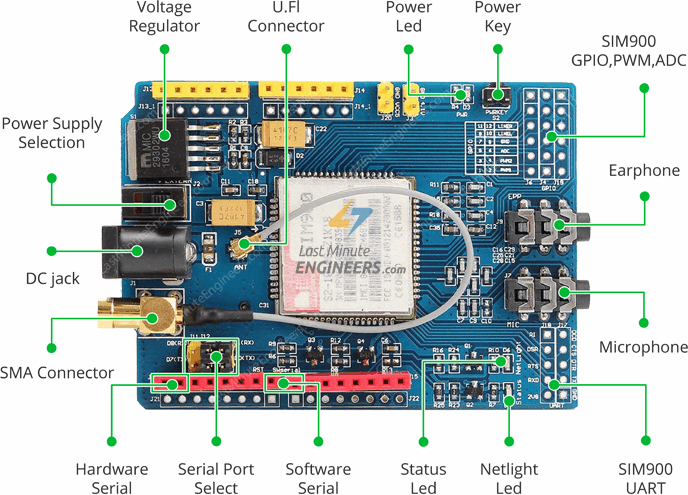 The SIM900 GSM/GPRS shield uses UART protocol to communicate with an Arduino. The chip supports baud rate from 1200bps to 115200bps with Auto-Baud detection. 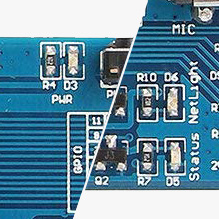 With the help of jumpers you can connect (RX,TX) of the shield to either Software Serial(D8,D7) or Hardware Serial(D1,D0) of the Arduino. 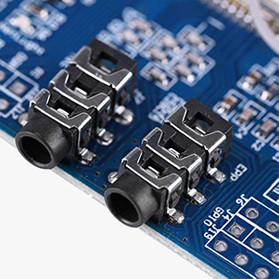 The shield comes with two standard 3.5mm jacks. One for stereo earphone and other for mono microphone. 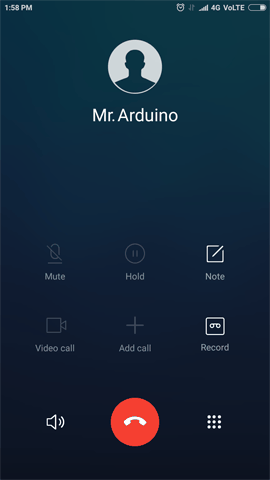 It allows you to use SIM900’s audio interface to make and receive voice calls and listen FM radio. Mic: You can connect an external electret microphone to this jack. Earphone: You can connect earphones to this jack. Any ‘iPhone’ or ‘Android’ compatible earphones should work. An antenna is required to use the SIM900 for any kind of voice or data communications as well as some SIM commands. The shield has two interfaces for connecting antenna viz. a U.FL connector and a SMA connector. They are connected through a patch cord. The shield usually comes with a 3dBi GSM antenna and allows you to put the shield inside a metal case(as long the antenna is outside). There’s a SIM socket on the back. Any activated, 2G full-size SIM card would work perfectly. The workings of the SIM card socket can take some getting used to. To unlock the latch, push the top part of the assembly, and then lift it up. 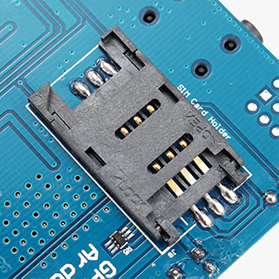 Place the SIM card into the bottom part of the socket. Then fold the arm back into the body of the socket, and gently push it forward towards the LOCK position. The SIM900 shield can be configured to keep time. So there is no need for any separate RTC. This will keep the time even when the power is OFF. 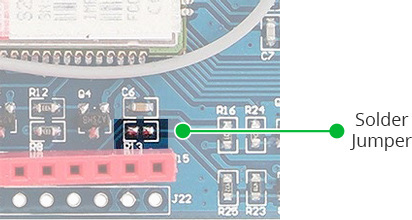 If you want to use internal RTC, you need to install CR1220 battery at the back side of the shield. Your network provider may not support setting the time automatically. In that case you can do it manually using AT+CCLK AT command. 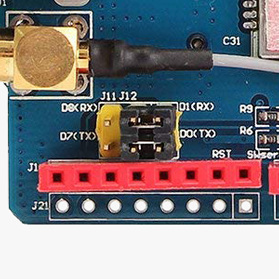 To start with, connect D7(Tx) and D8(Rx) pin on shield to digital pin#7 and #8 on Arduino. As we’ll be using software serial to talk to the shield, make sure the jumper cap is placed on the software serial port select. Power the shield using external power supply rated 5V 2A. 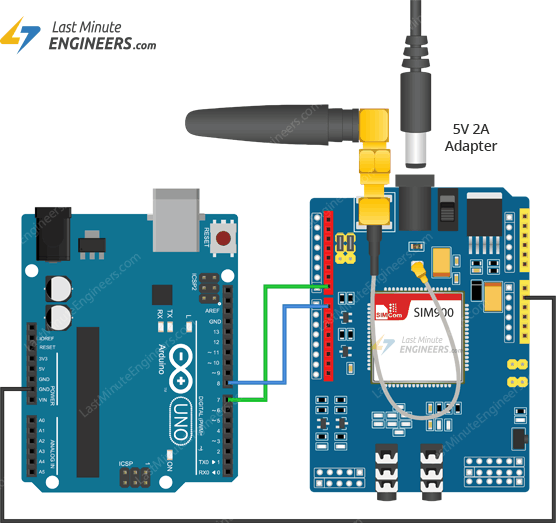 Do not be tempted to connect this pin to 5V supply on Arduino, as the shield may not work due to the lack of supply current. Also make sure you select the external power source with the slide switch next to the DC jack. Now connect all the ground in the circuit. Finally, connect the antenna, insert fully activated SIM card in the socket. 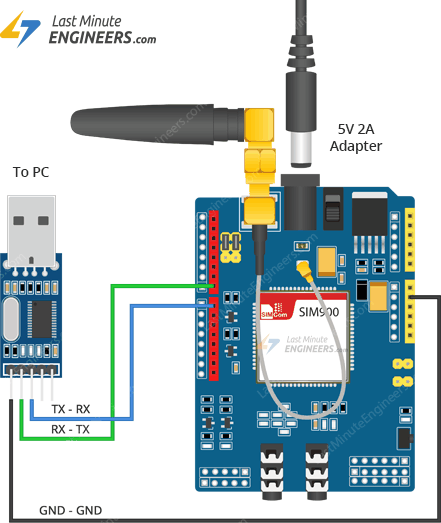 In order to operate SIM900 GSM Shield directly over PC, you need to connect it to PC using any USB to TTL converter. Below image shows SIM900 GSM Shield connected to PC through PL2303 USB to TTL converter. Even if you power the shield up, you need to turn on the SIM900 chip to get it working. As per datasheet, pulling the PWRKEY pin on the chip LOW for at least 1 second will power up/down the chip. There are two ways to do this with our shield. 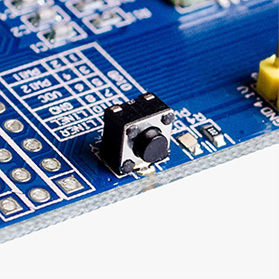 The shield comes with a right angle tactile switch situated near the PWR LED indicator. You need to press that switch for about 2 seconds to power the shield up/down. Instead of manually pressing the PWRKEY every time, you can turn the SIM900 up/down programmatically. 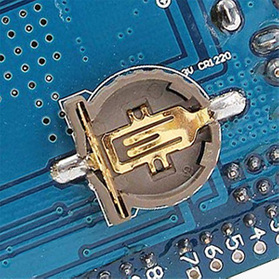 First, you need to solder the SMD jumper named R13 on the shield as highlighted in the image. 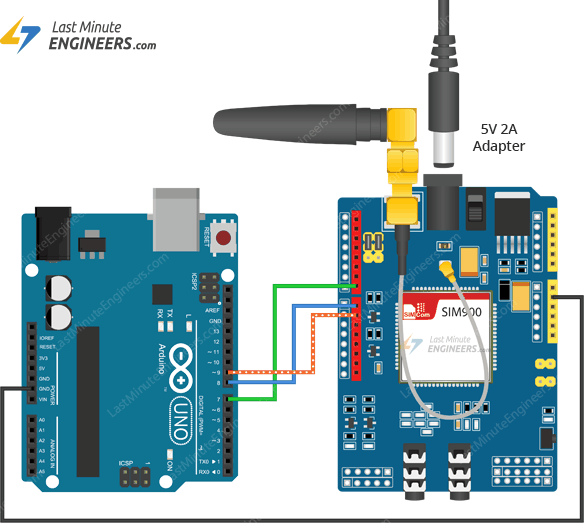 Next, you need to connect D9 pin on the shield to the D9 pin on Arduino. Finally, you need to add following custom function in your program. For sending AT commands and communicating with the SIM900 shield, we will use the serial monitor. 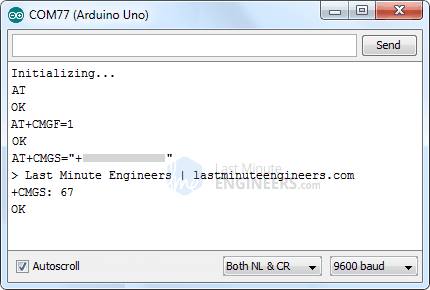 Below sketch will enable the Arduino to communicate with the SIM900 shield on serial monitor. 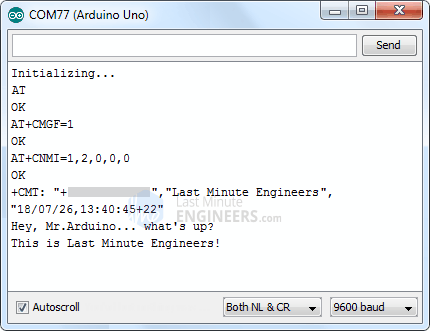 Before we proceed with detailed breakdown of code, connect your Arduino to PC, compile below code and upload it to the Arduino. 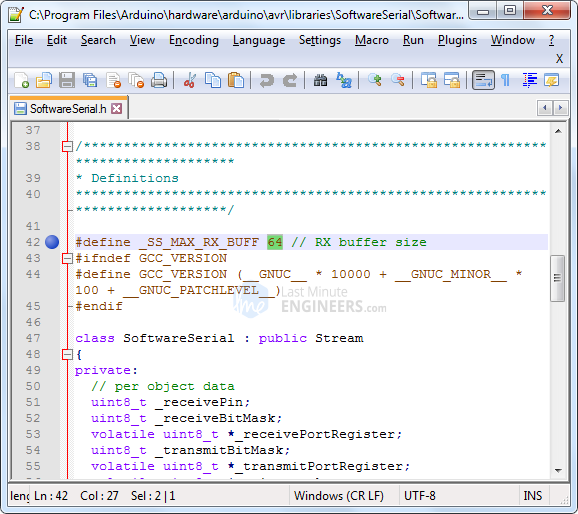 The sketch starts by including a SoftwareSerial.h library and initializing it with the Arduino pins to which Tx and Rx of SIM900 shield is connected. 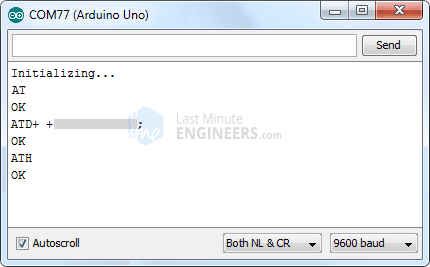 In setup function: we initialize a serial communication link between Arduino, Arduino IDE and SIM900 shield at a baud rate of 9600. 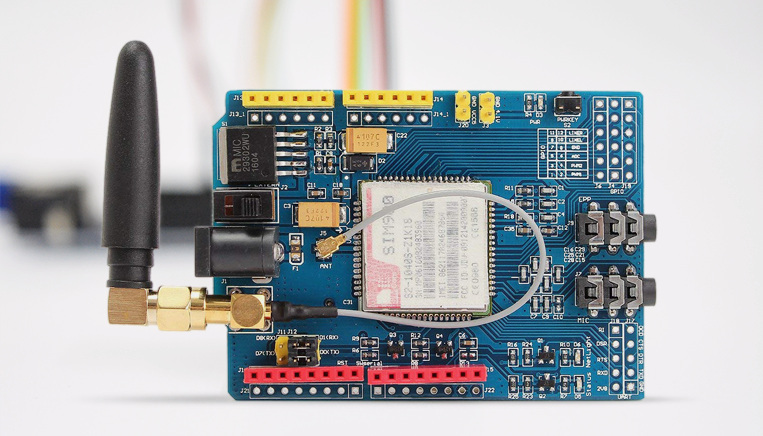 Now that we have established a basic connection, we will try to communicate with the SIM900 shield by sending AT commands. 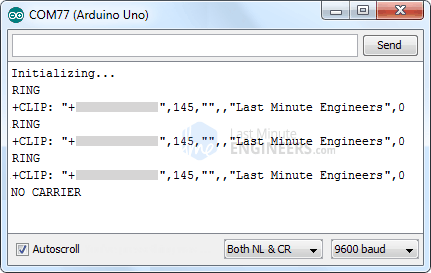 In the looping part of the code, we call custom function called updateSerial() which continuously waits for any inputs from the serial monitor and send it to the SIM900 shield through the D8 pin (Rx of shield). It also continuously reads the D7 pin (Tx of shield) if the shield has any responses. For more SIM900 AT Commands, please refer below document. 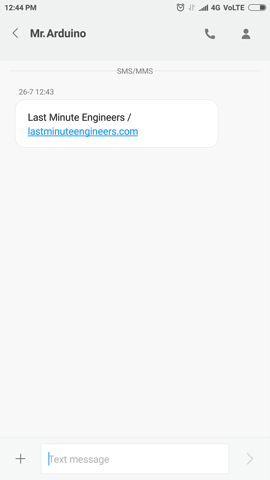 The loop is kept empty as we want to send SMS only once. 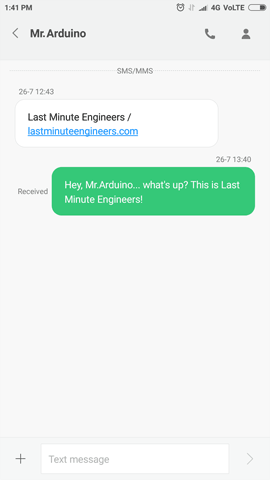 If you wish to send SMS one more time, just hit the RESET key on your Arduino. Below screenshot shows SMS sent from SIM900 GSM/GPRS shield. AT+CNMI=1,2,0,0,0 – specifies how newly arrived SMS messages should be handled. This way you can tell the SIM900 shield either to forward newly arrived SMS messages directly to the PC, or to save them in message storage and then notify the PC about their locations in message storage. Note that this time we have NOT kept the loop function empty as we are polling for newly arrived SMS messages. 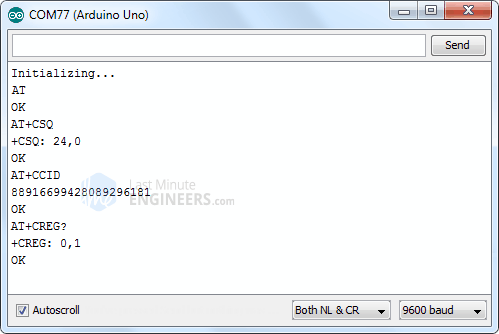 Once you send the SMS to SIM900 GSM/GPRS shield, you will see below output on serial monitor. The simplest solution to this is to increase the size of the SoftwareSerial buffer from its default size of 64 bytes to 256 bytes (or smaller, depending on what works for you). ATD+ +ZZxxxxxxxxxx; – Dials a specified number. The semicolon ; modifier at the end separates the dial string into multiple dial commands. All but the last command must end with the semicolon ; modifier. Below screenshot shows call made from SIM900 GSM/GPRS shield. Receiving call doesn’t require any special code; you just have to keep listening to the SIM900 shield. Yet, you may find this sketch very useful, when you need to trigger an action when a call from specific phone number is received. 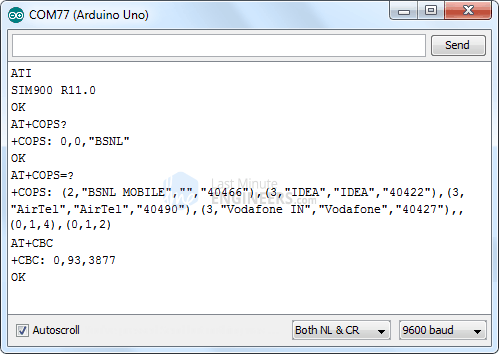 Below output on serial monitor shows call received by SIM900 GSM/GPRS shield.